Monitor Audio’s new Gold series is both big and clever. With voluminous cabinets showcasing ten years of evolution, it continues to uphold the brand's reputation as one of the true greats in British loudspeaker manufacturing. For me, this very-nearly-the-top-but-not-quite range represents peak value for money, since you get most of the premium engineering that Monitor Audio has devised without having to pay for the privilege of owning the Platinum flagships. One of the clever things about the Gold line is how you can configure and use the speakers either as a hi-fi purist or with the slightly different matter of movie soundtrack playback in mind. This is evidenced by two signal paths through the W15 subwoofer (one stereo feed, the other an LFE mono input) plus the Movie/Music/Impact/OFF EQ curve positions of its DSP; and the ability to control auto-switching of the surround FX speakers from dipole to monopole use via a 12V trigger, of which more later. Monitor Audio offers the Gold Series in a dark walnut veneer, lustrous white or black lacquers and a rich Ebony wood piano finish, The latter adds a chunk to the cost (£1,300, in fact). 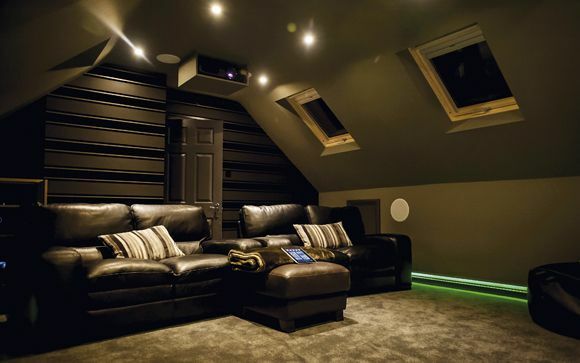 The suggested package price of our black lacquer system is a shade over £7,000. The stars of the show, visually, are the three-way rear-ported floorstanders, called Gold 300. The Gold C350 centre speaker isn't exactly small either. Finishing off the array is the massively dense W15 subwoofer (25mm-thick woodwork all round) and those Gold FX surrounds. The latter have six drivers in them and are designed to be wall-mounted. In monopole use only the front-facing midbass driver and tweeter are employed. Go to dipole mode (either manually via the front switch or via 12V trigger) and the side-mounted drivers come into play (the front tweeter is deactivated in this instance). Dipole will be the weapon of choice for those who like a THX-style diffuse soundfield, particularly when used in a 7.1 setup. While I acknowledge that the Gold FX is damned clever, my personal preference would be to run a pair of the bigger monopole bookshelf designs, the Gold 100s, as I'm a sucker for full surround directivity, a la IMAX. Onto the driver tech. The C-CAM (Ceramic-Coated Aluminium/Magnesium) cones of the mid and bass units in the main speakers are a bonded composite. Ceramic has very low bend or stretch, and when molecularly-bonded to the metal layer that has massive inherent rigidity of its own, it makes a tremendous piston. Hence the drivers' RST (Rigid Surface Technology) branding. That the metal is not just aluminium but is alloyed with the softer but lighter magnesium means it makes a lower moving mass cone assembly. For this iteration, the cone profile has been tweaked with the central concavities seen on the previous GR and GS models enhanced to the shape of a continuous radiating dish. There's now a longer voice coil working behind the scenes, and a larger motor overall with greater excursion, which MA says has improved driver efficiency and lowered distortion. I particularly like the C-CAM ribbon tweeter. Such high-frequency drivers are often able to reach so far beyond normal hearing ranges that the overtones and harmonics that do get into recordings of all kinds are relevant. Monitor Audio's latest generation has been constructed to a closer tolerance than ever, which makes a difference with the micro-engineering of high-frequency units. They're claimed to reach 60kHz and are meticulously pair-matched. The Gold Series grilles are now midi-length, held on by embedded neodymium magnets. More of the lush cabinetry can therefore be seen. A good thing, as the finish is superb. The drivers each employ bolt-through fixings. These are cabinet-deep and the back bolt fixing shows as a nubbin of metal on the rear of the enclosure. This technique ensures huge strength and rigidity, and – best of all – is used to decouple the driver from the front baffle, negating against smearing of leading edges by micro baffle-flex. Monitor Audio isn't too proud to use someone else’s DSP for its subwoofers’ in-room control. I have used many of these systems and they vary enormously in efficacy and ease of use. This one, dubbed LEO from D2 Audio, is über-slick – plug in the mic, press one button and wait while its test tones detect room mode issues and the DSP applies a correction frequency curve. For this review, I broke the seal on my Blu-ray of Neill Blomkamp’s Chappie. I loved his District 9 and despite its daftness, adored Elysium, too. Chappie was slated by some reviewers but I think it’s rather brilliant. I also revisited Dreamworks’ Turbo. Deeply silly but lovely of soundtrack, like most animations. In Chappie, our protagonist gets involved in stealing cars. He heads out with the gangsters, played by members of Die Antwoord (a rugged Afrikaans-spitting rap act) to go thieving. As the sequence begins, a swell of bassline-infused rap music kicks in. As I'd already been immediately impressed by the clarity and power of the Gold 300AV package, this massive rise in bass weight and overall scale – and with no hint of any distortion or lack of linearity – caught me by surprise. What I had thought was big and clear up until then turned out to be the MA speakers just on tick over. The ability to dig out a little incidental sound in the midst of a major crescendo shows the sheer class of this array. Chappie tosses his favourite toy, a squeaky rubber chicken, into the road in front of a Nissan Skyline before he car-jacks it (with hilariously inappropriate reasoning) – even gesticulating with the chicken as he throws the car owner into the weeds. Both the first and second ‘angrier’ squeaky-toy noises were portrayed with accuracy and presence, making the sequence as funny as it is meant to be. MA's leaf tweeters offer enormous detail with no stridency at all. I tried the FX rears in dipole mode, but as that mutes said HF driver I soon found myself switching back to monopole. Even though the gold dome tweeters in the fore-and-aft faces of the FX surrounds are a stalwart of many a Monitor Audio speaker, they are outclassed here. Of course, the good news is that buyers can discover which presentation they like best. With Turbo, I was surprised by how powerfully these surround speakers could play. They can really do it. The movie puts you on a racetrack with automobiles zooming through your viewing room. The power and speed of the sudden increase in engine noises was astonishing. As each Indy car comes from behind and out through the front, some on the left, then some on the right, the sound through the Gold system was almost a physical blow and terrifyingly realistic. And yet in the snail’s tomato patch elsewhere in the movie, it was all about delicacy and detail at tiny background levels. The three-way Gold C350 centre speaker does a truly full-scale job, and presents dialogue in its stride. Gunfire, shouting and breaking glass during Chappie's Johannesburg riot scene are rendered perfectly with no congestion. Impressive. That film's soundtrack is filled with massive low-end drops. Being British, Monitor Audio only offers ‘real’ specifications, and says its subwoofer bottoms out at 18Hz. Utter twaddle, if you ask me. The box is sealed, the Class D power plant is rated at 650W RMS/1,200W peak and the 15in driver’s suspension is very wobbly. I’d imagine it reaches single figures in Hz and with tight DSP EQ control, it feels as if there is no limit in depth. It easily pressurised my entire room. So, the Gold 300AV array costs plenty but offers enormity. It has might and it has clarity. It can play sweet and linear at low levels or it can frighten the neighbours’ neighbours. The sheer bandwidth on tap is amazing and in truth, after admiring the design and finish and a little experimentation with the sub's EQ settings, you will rapidly forget about the enclosures. The sound is immediately engaging, grasping you by the senses and dragging you into a movie with ease. With the Gold 300AV you get delicious performance in every direction. You could pay more and get less.